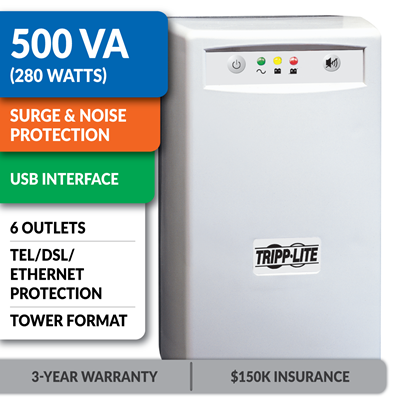 Tripp Lite's INTERNETOFFICE 500 standby UPS system offers surge suppression and long lasting battery support for personal computers, internetworking equipment and other sensitive electronics. Internal UPS circuits support entry level PC systems for up to 30 minutes during power failures and brownouts so that connected equipment can be shutdown without data loss. 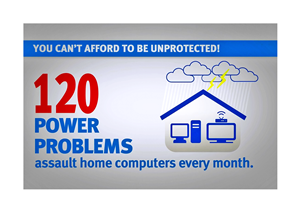 Offers complete desktop power protection in an attractive gray tower configuration. Includes 3 battery supported outlets for computer, monitor and one vital system peripheral, plus 3 additional surge suppression-only outlets for printers and other system accessories not requiring battery support.USB port enables optional unattended system shutdown without data loss in the case of extended power failure, cable included. PowerAlert software available via free download from www.tripplite.com. Built-in two line phone suppression protects modem, fax machine, cordless phone or other peripheral with a standard one or two line dialup/DSL phone connection. Built-in audible alarm and 3 front panel LEDs indicate line power status, battery power status and battery low/replace status. 500VA / 280 watt power handling ability supports entry-level PCs, network workstations, point-of-sale equipment, small business phone systems, audio/video equipment and home theater systems.Offers 5 minutes battery runtime with a full load of 500VA and 17 minutes with a half load of 250VA. Supports hot swap battery replacement via built-in access panel. This standby UPS system protects your valuable equipment from damage, downtime and data loss. Battery backup supports equipment during outages, power sags (brownouts) and overvoltages. Surge protection blocks harmful transient voltages on AC and phone lines. The tel/DSL jacks protect against "back door" surges over phone lines. The compact tower-style housing supports desk or floor placement. The 3-year warranty and $150,000 insurance reflect Tripp Lite's commitment to product quality and customer satisfaction. Why is this UPS a Good Investment? It would be nice if utility power was always reliable, but it isn't. Between severe weather, the aging electrical grid and hazards lurking inside your own walls, your equipment is under constant attack from power problems. Even a brief loss of power or a momentary surge can ruin your equipment and destroy irreplaceable data. Some costs, such as replacing broken computers and redoing work, can be measured. Other costs, such as losing family photos and missing business opportunities, are harder to quantify. For a fraction of these costs, you can prevent damage, downtime and data loss by installing this UPS system. It conditions incoming AC power, provides enough battery backup to outlast most outages and automatically saves open files and shuts down computers gracefully during extended blackouts. Single-Computer Runtime: This UPS system will support an energy-efficient desktop computer and LCD monitor (100W load) for up to 23 minutes during an outage. Half-Load Runtime: This UPS system will support a 50% load (140 W) for up to 14.8 minutes. Optimized Outlet Array: 3 outlets have both battery backup and surge/noise protection, and 3 have surge/noise protection without battery backup. The "surge-only" outlets allow you to connect additional equipment without overloading the UPS or reducing the backup runtime available during an outage. This UPS system includes built-in surge protection and noise filtering to shield your equipment from destructive transient voltages and electromagnetic (EMI/RFI) line noise. If AC line voltage is too high or too low for your equipment, the UPS system will also provide backup power to the battery-supported outlets until conditions improve or the battery is discharged. Data lines connected to your equipment represent an unlocked "back door," allowing surges to enter and damage or destroy sensitive electronic components. In addition to protecting against surges on the AC power line, this UPS system protects your equipment against surges on a connected phone or network line. The RJ11 jacks protect a phone, analog modem or DSL modem. Use the HID-compliant USB port and your computer's built-in power management features. Use the USB port with Tripp Lite's free PowerAlert® software. PowerAlert provides enhanced features like automatic file saves, event notification, logging, advanced device control and a web accessory card that supports centralized management. You can always download the latest version of PowerAlert at Tripp Lite's website. High Efficiency: This UPS system saves energy, produces less heat, shrinks your carbon footprint and reduces annual operating costs. User-Replaceable Battery: This UPS system has a user-replaceable, recyclable battery, allowing it to remain in service instead of going to a landfill. RoHS Compliance: This UPS system complies with the RoHS (Restriction of Hazardous Substances) Directive, limiting the use of hazardous substances in manufacturing. 3-Year Product Warranty: If this UPS system (including the internal battery) proves defective in material or workmanship within that period, Tripp Lite will repair or replace it at no charge. $150,000 Insurance: Tripp Lite will repair or replace connected equipment damaged by surges – even lightning strikes! Free Tech Support: Chicago-based, in-house tech specialists are available by phone, email and chat. Over 95 Years: Founded in 1922, Tripp Lite has a long-established and proven track record of providing reliable products and responsive customer service. Trusted Name: From the smallest office to the largest data center, customers worldwide trust Tripp Lite to power, protect, manage and connect valuable IT equipment. Tripp Lite has a policy of continuous improvement. Specifications are subject to change without notice. Actual products may differ slightly from photos. Tripp Lite uses primary and third-party agencies to test its products for compliance with standards. Runtime varies with load, battery condition and other factors. Go to Tripp Lite's website for more information, including complete warranty terms and conditions.